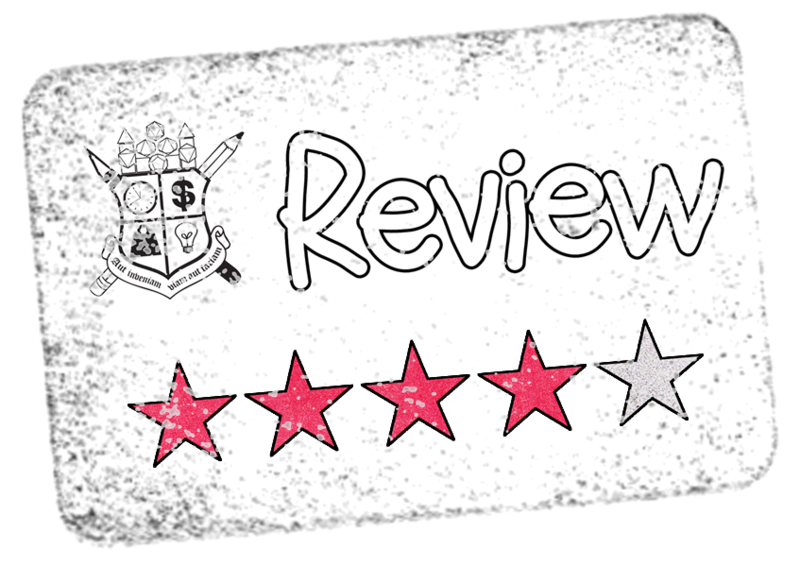 This week has been an interesting week as far as selecting a product to review. I'm sitting at my desk Monday, fat, dumb, and happy as always when a G+ post came across my way about a RPG Miniatures Kickstarter. Normally I'd be all BFD, but I decided to go ahead and check it out. I thought the minis were decent enough, but you can only get so much out of a video. One thing that caught my eye was that this project was from someone here in the Treasure Valley and about two seconds of digging led me to some of Brian Bartlow's other RPG products I had. It's been my intention to review some of those offerings once I manage to secure a cutting machine because I am so over trying to screw with a hobby knife for paper modeling. 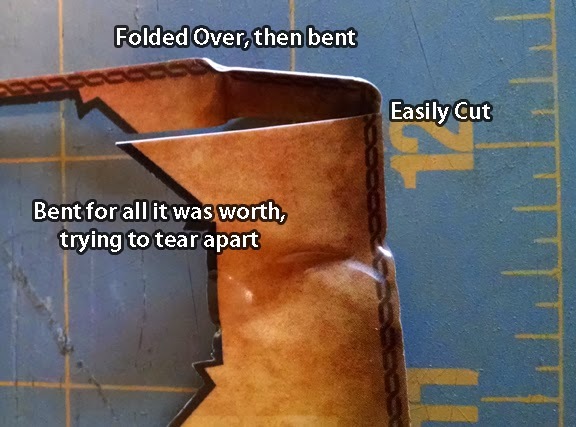 I love the attention to detail a good paper model can give, but I get tired of the cutting work too quickly. At any rate I wanted to reach out to Brian, the creator of Decks Miniatures (and Lone Tree Games) and see if there was any way I could check out the prototypes he had. I figured it wouldn't hurt to ask and I was fortunate in that he works not far from where I live. A quick meeting over lunch is the perfect excuse to be able to hit up one of my favorite pizza places. We talked about the Decks Miniatures, Kickstarter, and some other gaming matters over a couple of slices (for the purposes of objectivity.....I bought my own lunch!) Brian game me a small selection of one of his 1st generation prototypes for review. I'm actually only putting one together for review so I can send out the rest to other folks that might be interested. Before meeting with Brian I did bother to go look at pricing at other miniatures, ranging from paper ($0-$5 for a set, $1 page quality printing) to unpainted plastic ($1.50 to $2.29) and painted plastic ($3.00 to $5.00). Of course these numbers are approximate and don't count an awesome eBay score or just dumb luck when shopping for figures. I didn't even bother to look at metal figs because I put them in a different category altogether. $50 for a set of 61 minis comes out to an average price of 82¢ a piece. This definitely puts them somewhere between a paper mini and an unpainted plastic mini, which is what I'd categorize the Decks Miniatures just looking at them. Since our meeting, Brian has created a $25 tier that gives you 24 minis at $1.04 a piece, still in the "appropriate" range as far as I'm concerned. The primary reason for his $10K Kickstarter request is essentially what I consider the "proper" purpose is, not so much pre-orders but the ability to source appropriate materials and labor at a volume discount. The 1st generation prototypes were actually printed in Boise (more on that later) and shipped to Minnesota (maybe Wisconsin) for laser cutting. The bulk of the hard work has already been done, which is the creation of the art and formatting. $10K is completely do-able since that is "only" 200 pledges at the $50 level. With that initial series of thought out of the way I was able to turn my attention to the actual prototypes. My first thought when getting hands-on with the cards were that they were so damned thin, flimsy even. When putting together the troll mini, the plastic stock didn't come across as flimsy at all. I tried to make some serious cuts into it with my knife, which didn't go through. Then I tried warping the stock repeatedly and even taking a small section and folding it over before bending the heck out of it. The best I could do is get a little separation of the card. If you manhandle the minis as much as I had to in order to get any beginning of failure, then you deserve some messed-up minis! None of my other minis would even come close to taking that level of abuse. Cutting the stock with a scissors was quite easy though, so working from an edge with a knife isn't difficult. 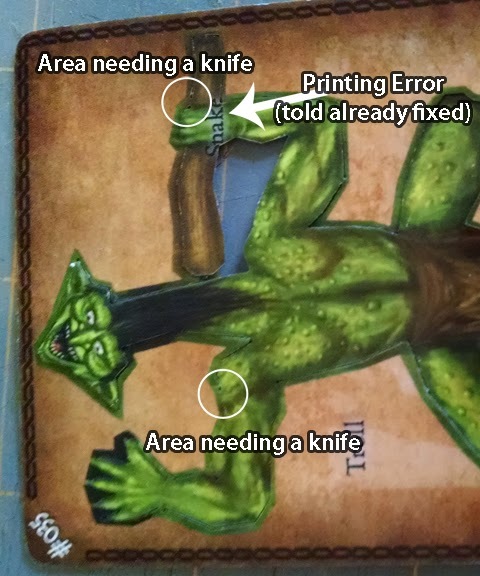 This is good because with these being 1st gen prototypes, the laser cuts needed some refinement.There was one small spot on my Troll that needed a knife. Now to be fair, Brian did send me home with a sheet of instructions which noted that because this was a prototype the cuts were off and use of a knife for the entire mini was recommended. I purposely didn't read the instructions until after assembling the mini to see how intuitive it would be. Another concern for some folks already is the fact that the plastic stock is white, so you get a white edge showing up all over the model. This isn't a design feature or oversight, it is just what happens when you source materials for a prototype locally. The white stock has never been intended for use with the final mini because one of the purposes of the Kickstarter is to source appropriate materials! 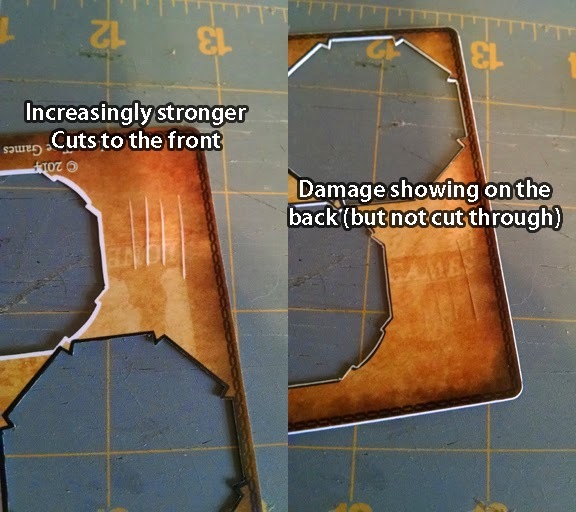 Even with the white edges I find it no more off-putting than looking at either my crappy-painted minis or, and admit that this applies to far too many of us, unpainted minis. 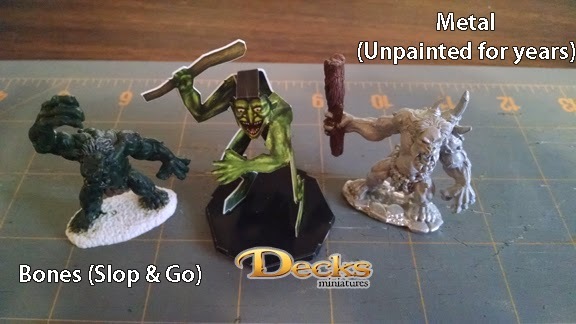 Overall I have to give these minis four out of five stars, and that is only because I am judging them as-is and not making assumptions as to the quality of the final product, which is bound to contain better materials and cuts (Brian is already working on 2nd Gen Prototypes). 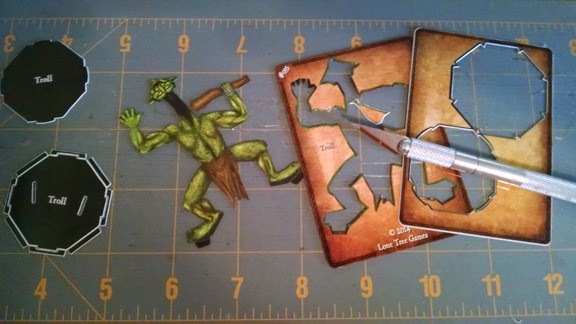 I think that the Decks Miniatures easily fill a niche between paper minis and "traditional" plastic minis. The price is right, the time to prepare is excellent, and durability for the resources is outstanding. I think for many folks it'll come down to their own preference for minis. Paper miniature GMs might really like the ease of assembly and the durability. GMs who prefer metal or bare plastic minis that they paint up may never be persuaded, but the cost, durability, and ease of use can be huge factors. When I started the Frugal GM blog almost 2 1/2 years ago my stated goal was to bring you ideas and products that saved you one of four important resources: Time, Money, Weight, and Ideas. 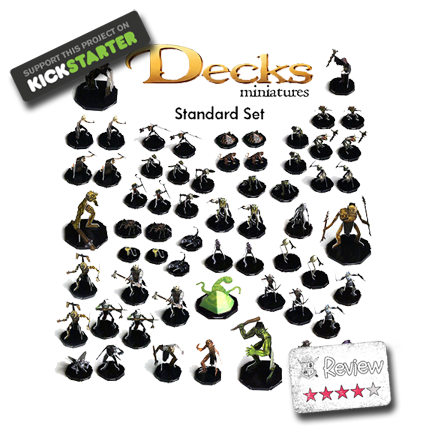 Without a doubt the Decks Miniatures will save you Time, Money, and Weight compared to the current options on the market. I cannot wait to get paid so I can pledge and get a set for myself, and I hope to see these in my FLGS soon.